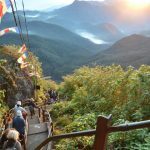 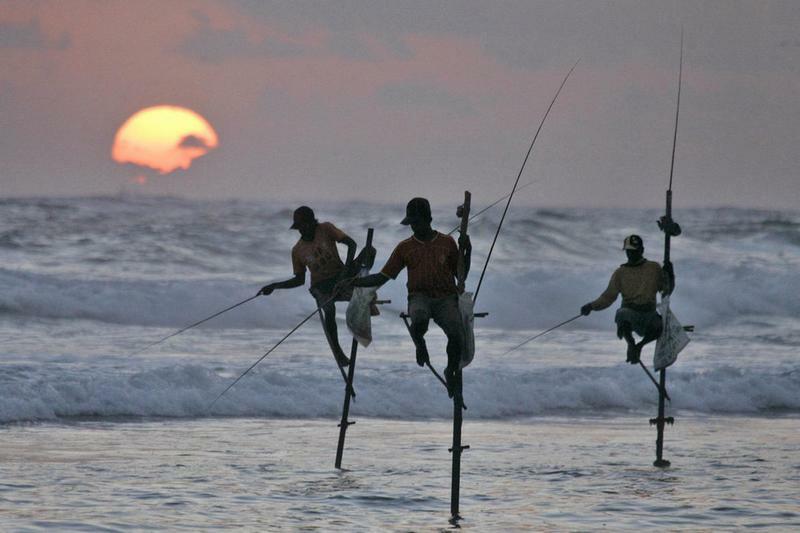 The art of fishing on stilts in Sri Lanka - Living + Nomads – Travel tips, Guides, News & Information! 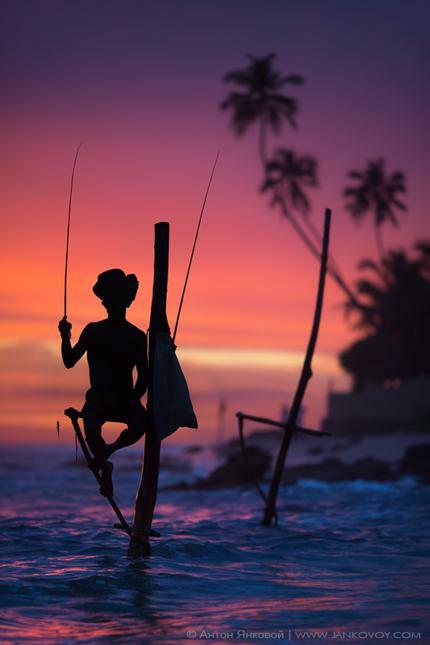 Images of small men with sturdy faces and firm skin sitting firmly on stilts in front of an immense sea have become objects of photographers in beautiful Sri Lanka. 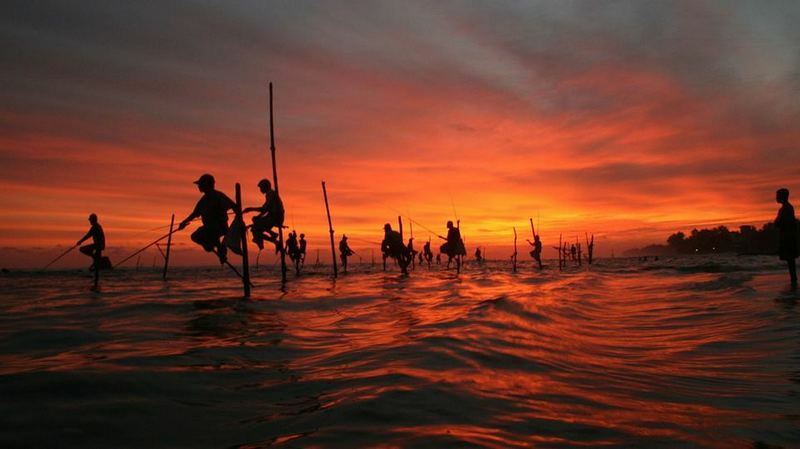 In the sparkling sunset on the horizon, simple stilts in the sea create a unique image. 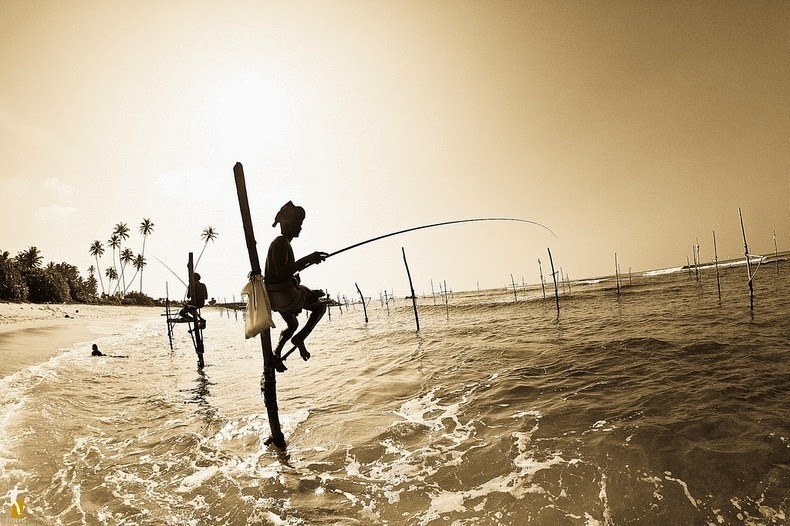 On the serene surface, stilts are set solidly on the path near the sea to provide ideal fishing places. 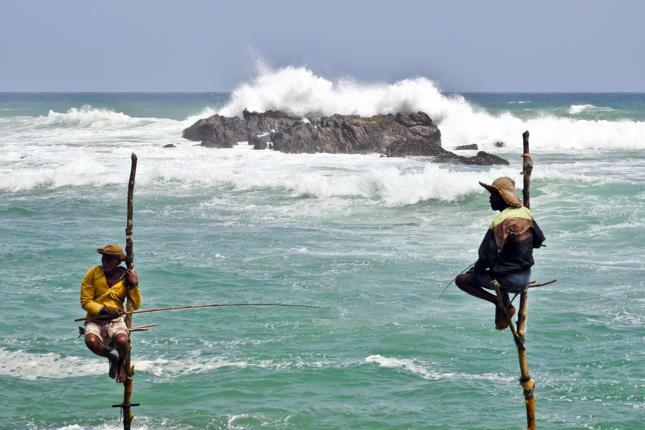 At 4p.m, fishermen from Galle fishing village gather in this sea to prepare to fish. 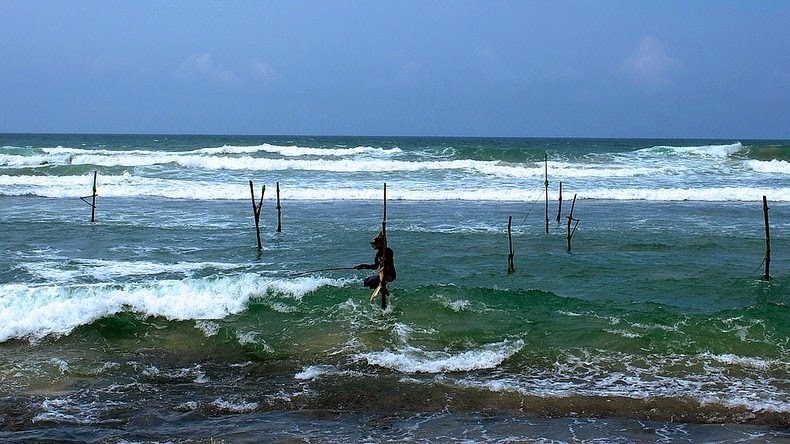 Anglers of Kathaluwa start to use their strong hands, rowing against strong winds to their fishing positions. 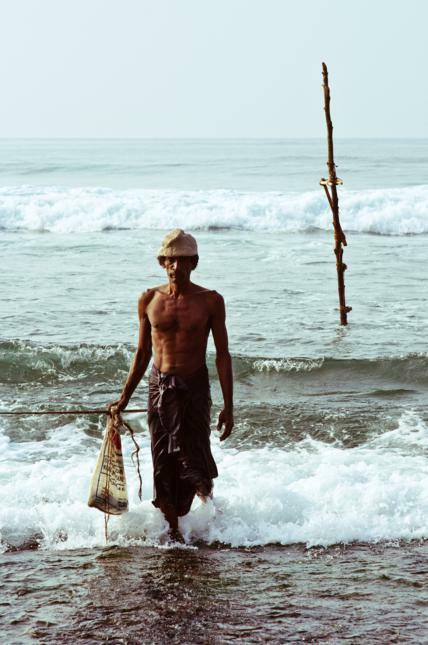 The stilt is about 2m in length. 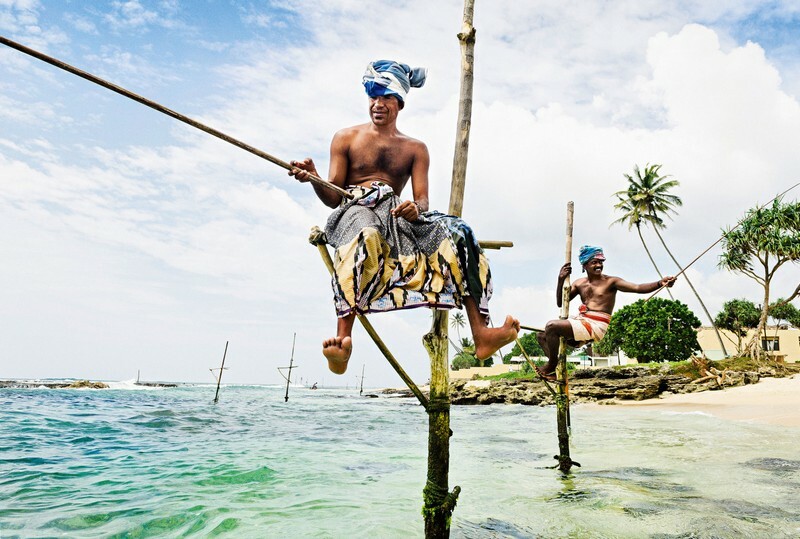 Anglers sit on the cross piece named petta which sticks from a vertical stilt plugged into the coral reef. 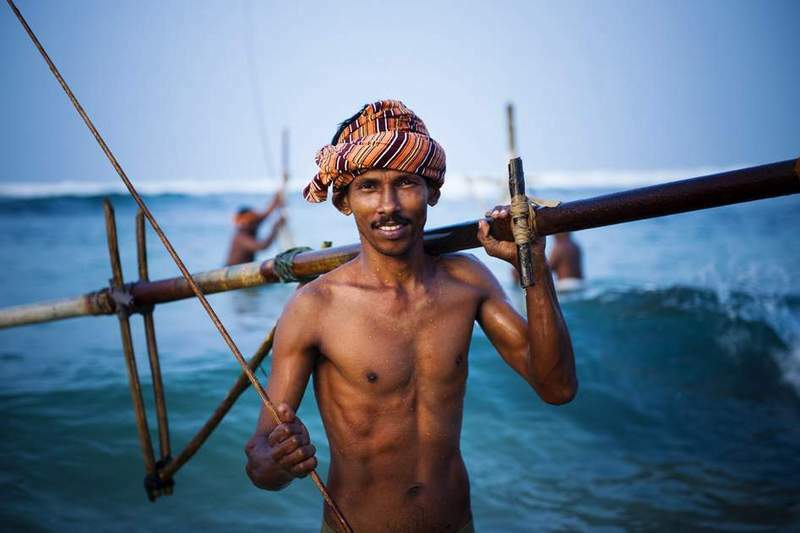 They use one hand to hold the stilt and the other to take in the fishing-line with the hope of catching herring fish or small tuna. 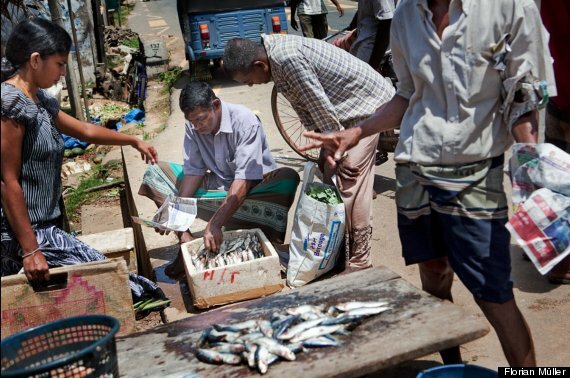 Caught fish will be kept in a plastic bag tightened around their waist or the stilt. 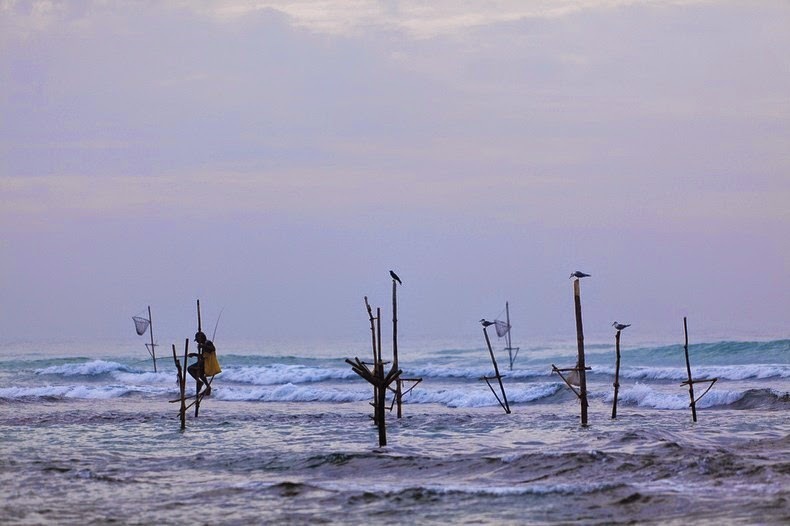 Fishing on stilts is a long-standing tradition for about 500 fishing families in Western Sri Lanka, Galle district, especially around Kathaluwa and Ahangama. 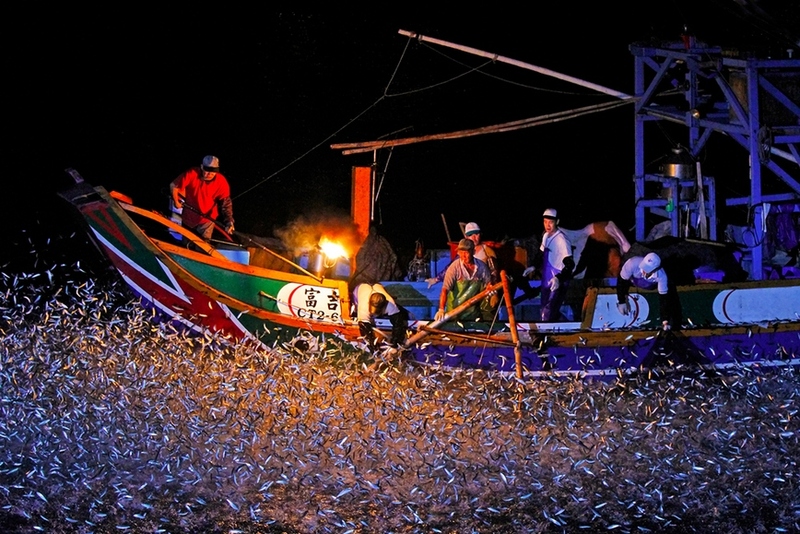 No one can you tell the exact origin of this activity. 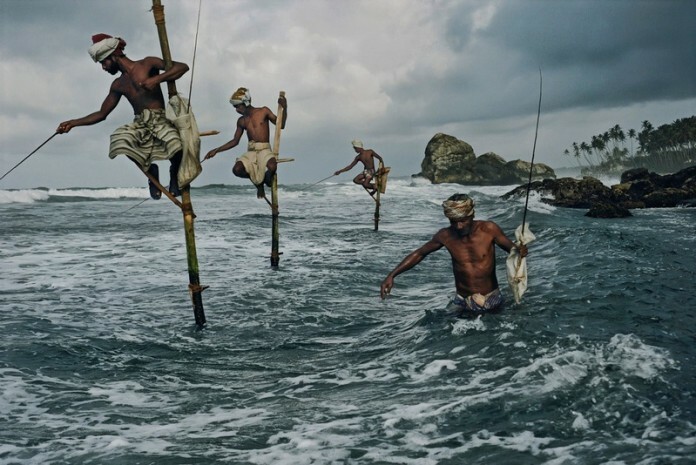 According to some old fishermen, this way of fishing was created after the end of World War II. 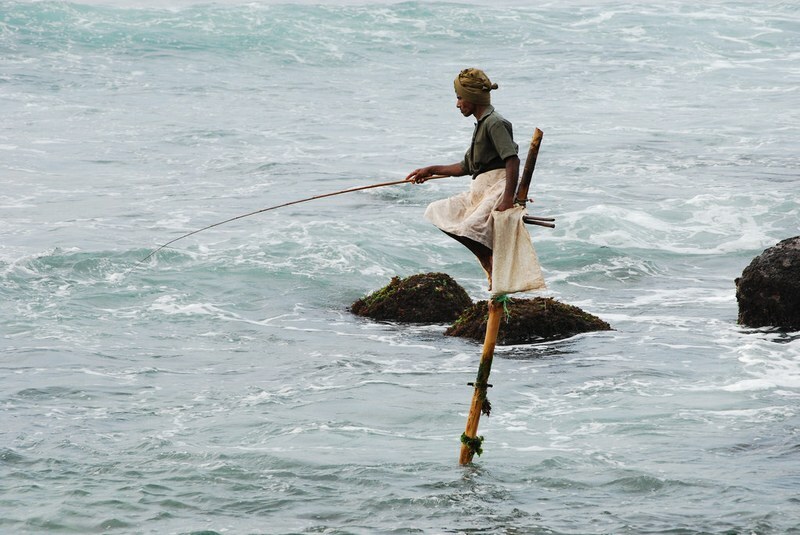 At that time, they sat on cliffs over the ocean to fish. 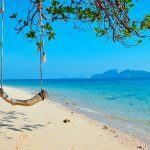 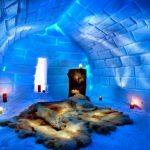 They used iron bars left after the World War and plugged them in the coral reefs. 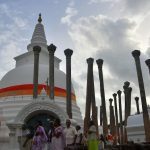 Then, when iron bars started to become rare, they changed to wooden bars and pillars that they found very suitable to replace the rusted iron posts. 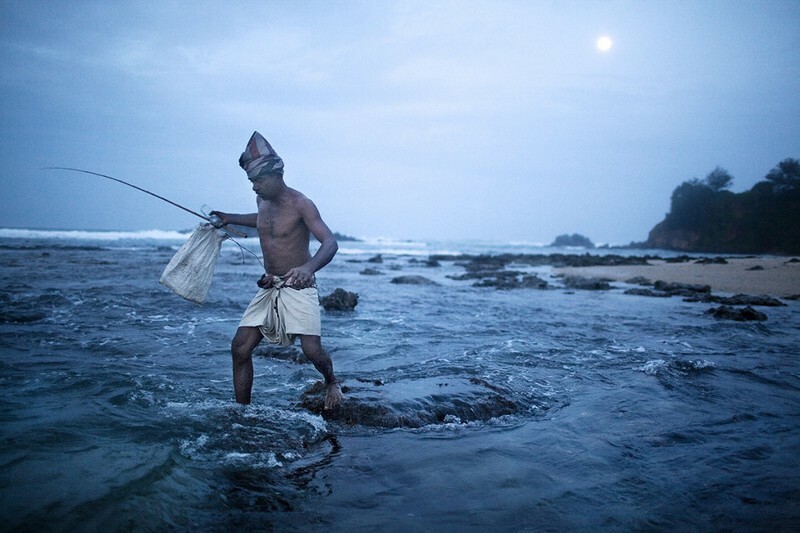 Some other revealed that this interesting way of fishing came to be because ancient fishermen were too poor to buy fishing boats. 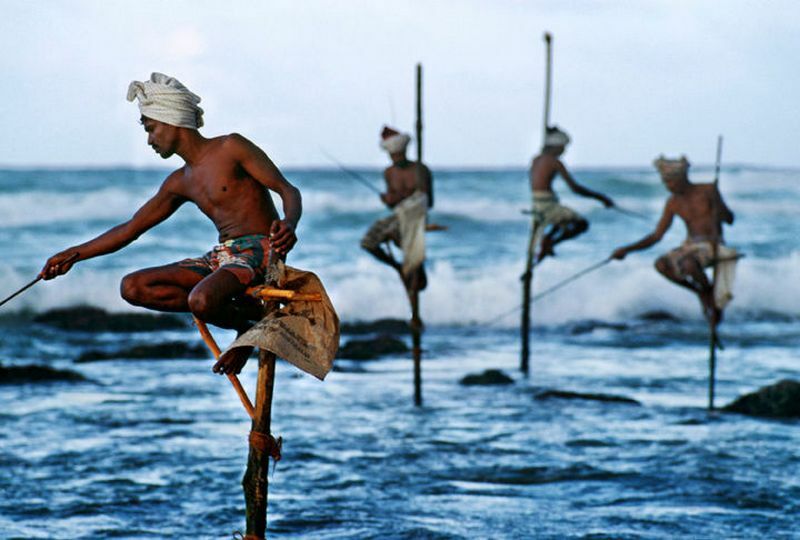 They thought of fishing on stilts and passed the technique from generation to generation. 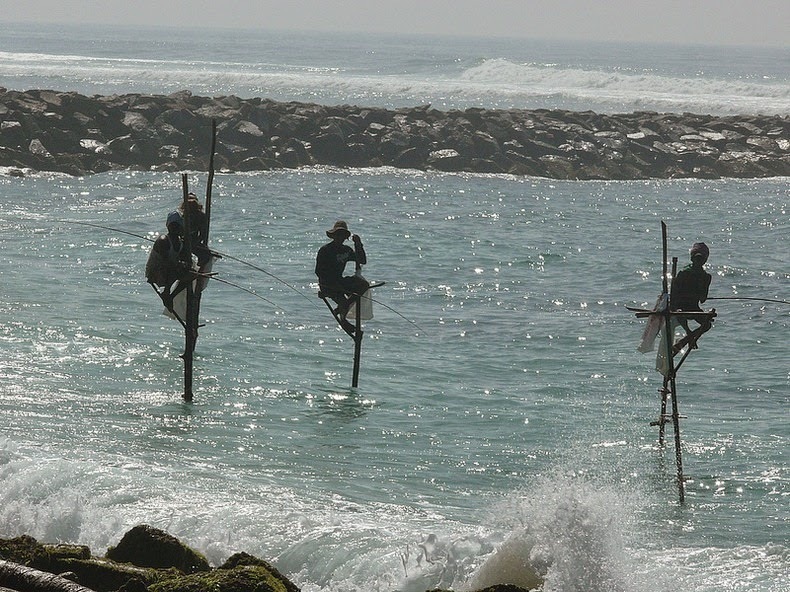 Another explanation is a concern for the environment when local people here, instead of using fishing nets, fish on stilts. 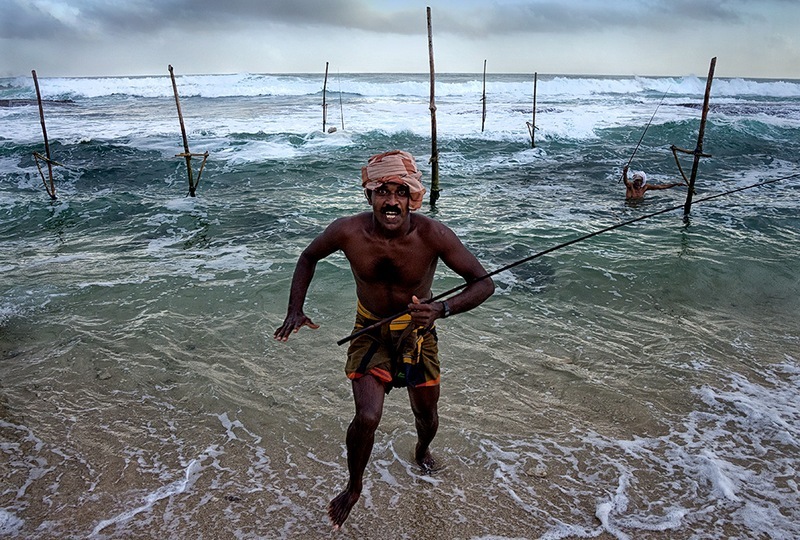 They reckon that using nets will disturb the fish and they will not come back to this sea for many years. 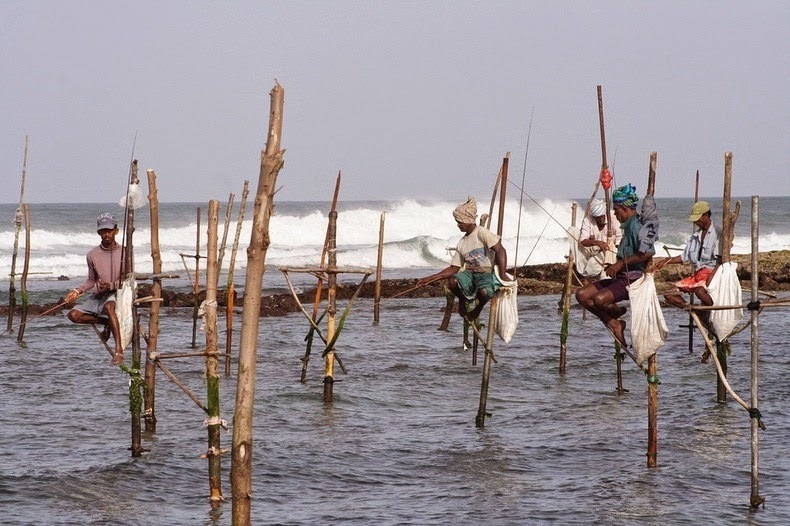 Stilts are simple and do not worry the fish, so they will stay at this area. 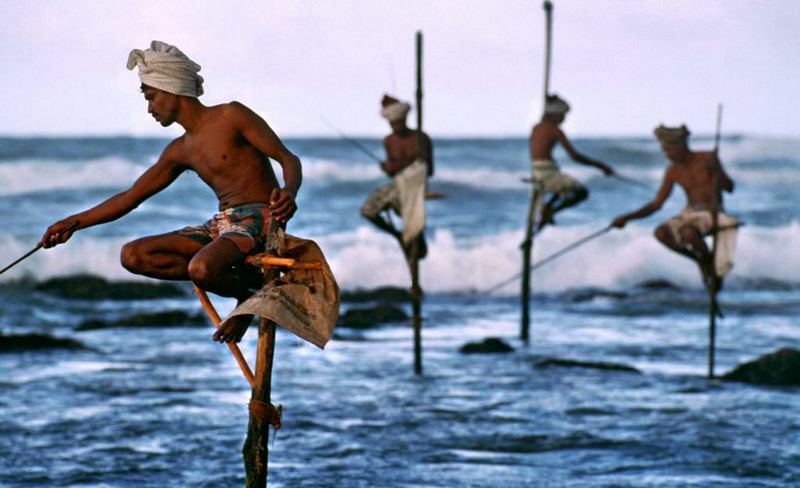 Therefore, local people wait patiently on their stilts until fish are caught on their fishinghooks. 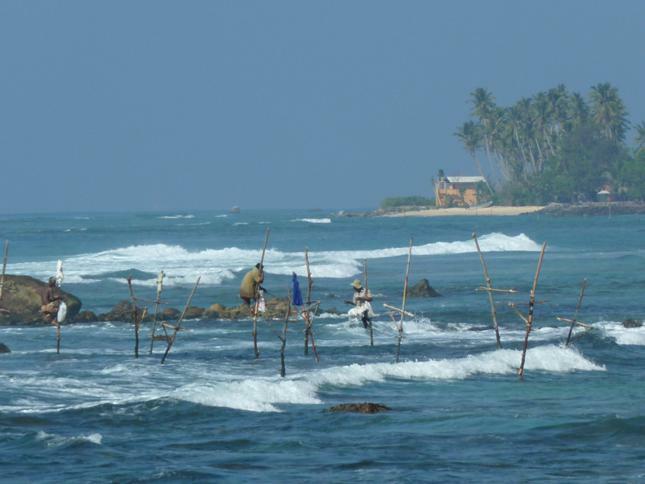 Local people here spend two days fishing and hours on the sea. 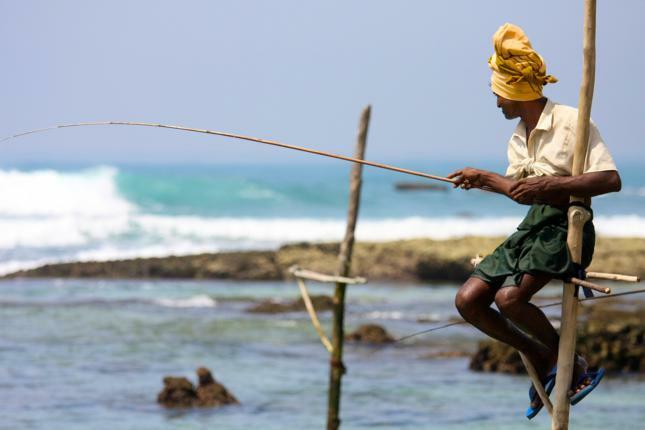 With a fishing rod, a bag and some cigarettes, fishermen wearing scarves on their heads and an unfastened shirt wait for fish. 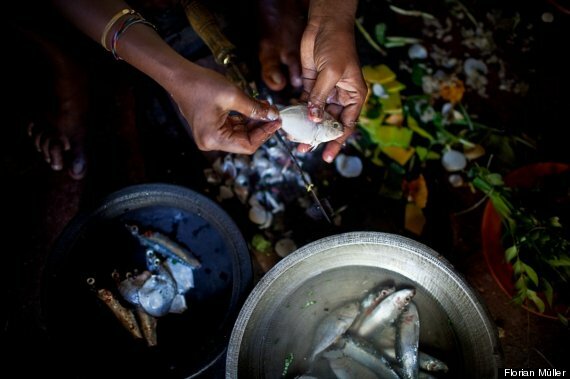 Fish caught in the afternoon are smaller and will be used as baits for the following morning for bigger ones. 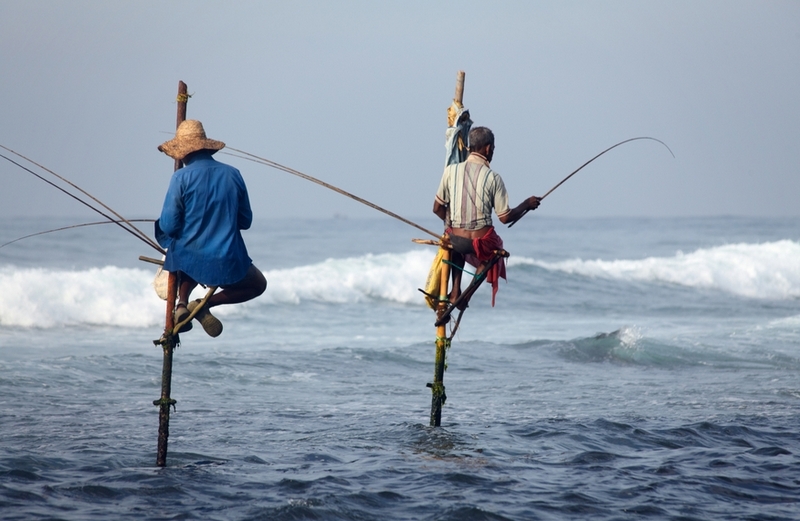 Not everyone is patient to sit on stilts on the sea. 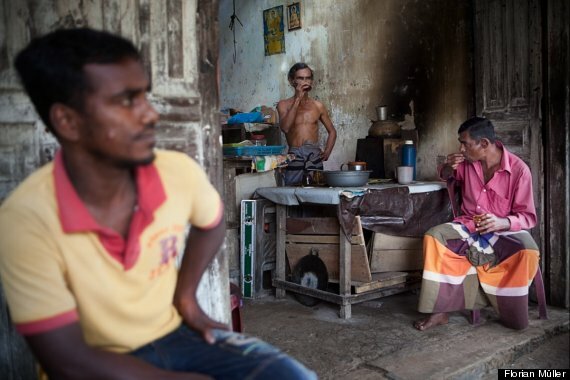 After hours under the shining sunshine, booties can be sold or served in the meals of their families. 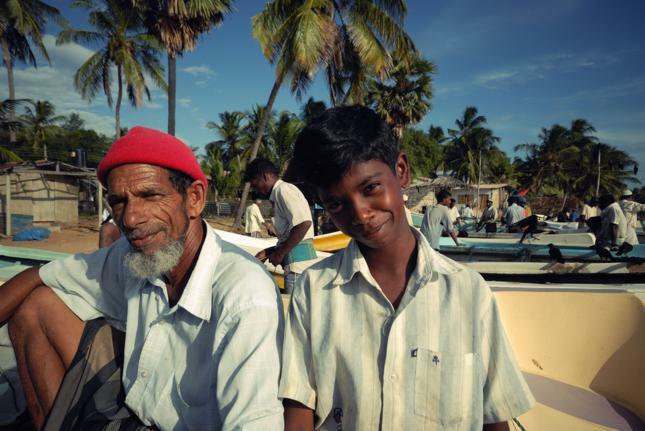 The tradition of fishing is passed from father to son with particular skills in each family. 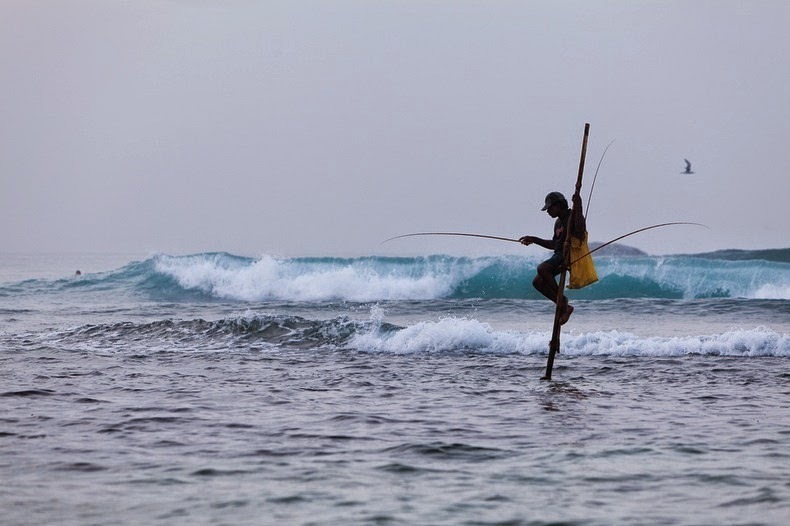 Fishing on stilts is a traditional lifestyle for local people in Sri Lanka and each stilt is considered as a family’s property that is handed down from generation to generation. 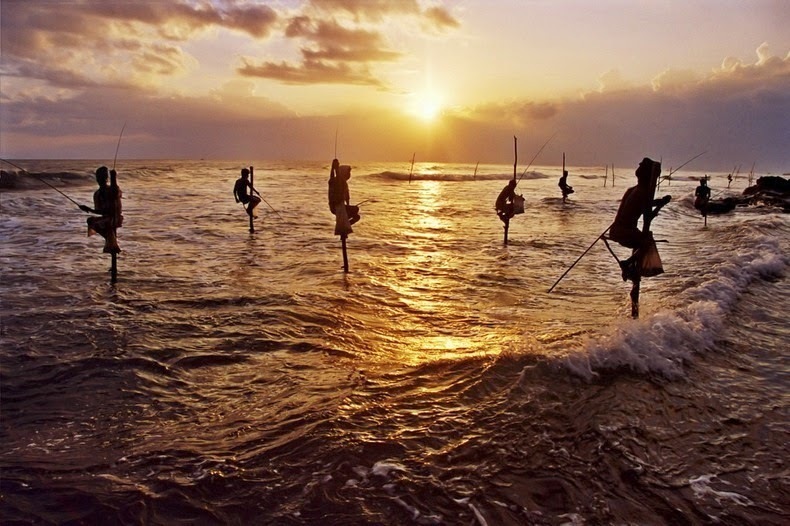 Until now, fishing on stilts has become a beautiful image of seaside areas in Sri Lanka. 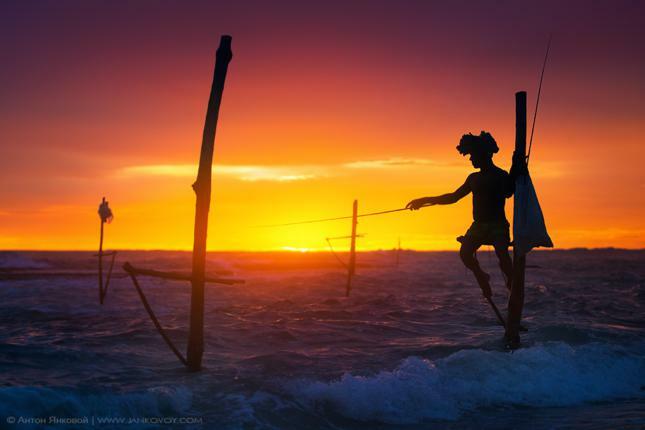 Sitting on stilts amidst the sky and water, in the red sunset, their faces are brightly reflected in surfing waves and high coconut trees as a striking picture of nature. 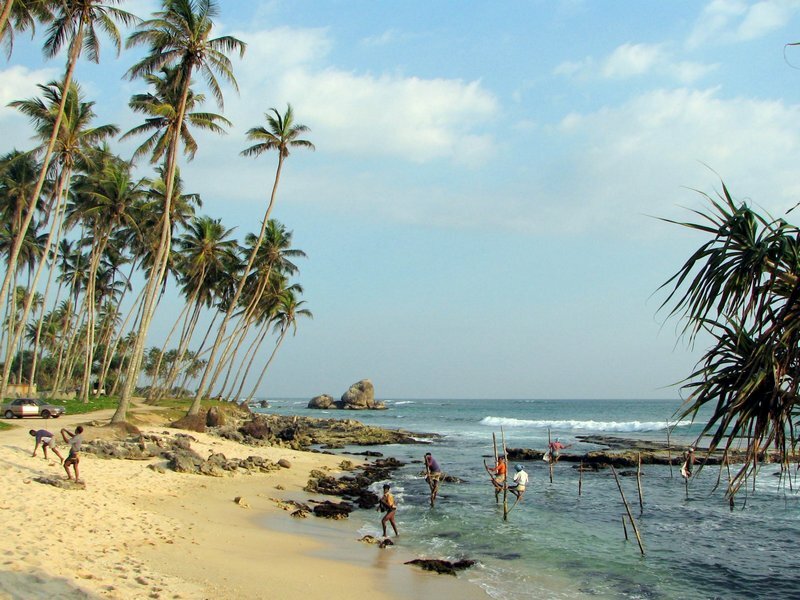 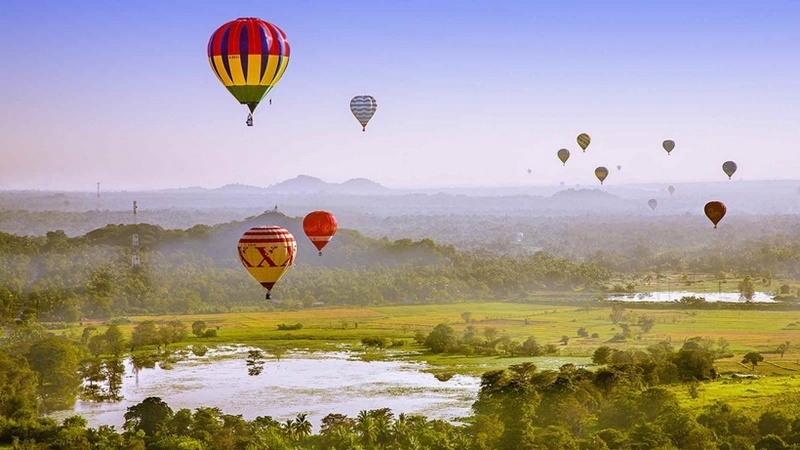 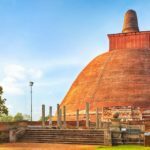 After the big tsunami in 2004, a part of the sea in Sri Lanka was also strongly affected and recovered slowly. 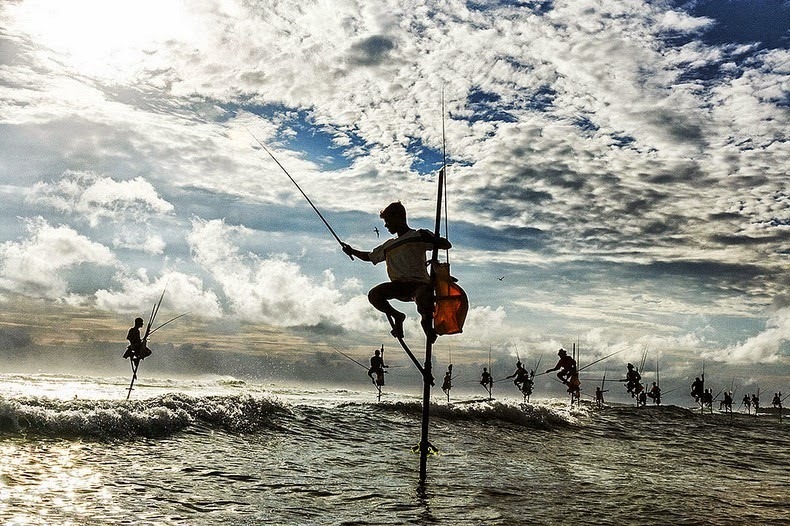 If you want to take pictures of local people fishing on stilts, travel to the Southwest of this country. 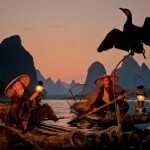 In some places, local people will ask you to pay them money to take photos. 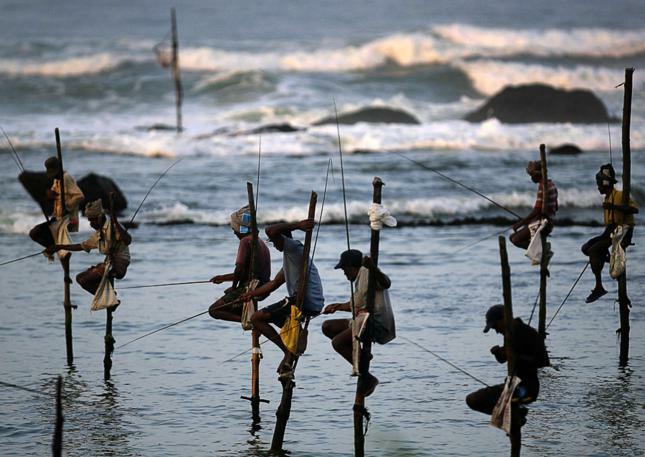 Note: Respect and do not disturb them when they are fishing in the sea.